Not feeling a 100% today so I decided that I needed a fortifying meal. Out came the Fish with Angelica soup ingredients again. The last time I made this, I used catfish. This time, I'm going to use kingfish. Yes, that mysterious kingfish that I bought from Carrefour. I am so proud of myself. My freezing techniques are superior by far! When I defrosted the kingfish, it looked almost as fresh as the day I bought it. The skin was glossy, the flesh was firm and the eyes were clear. Sweet! I decided that since I was not feeling the greatest, I also needed some kind of comfort food. Bugger, no milk. Well, I guess I'd make Dill Rice then. 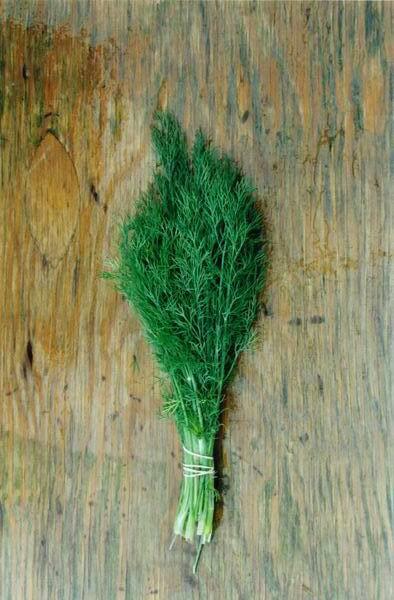 Something about dill always gives me comfort. Just the smell alone is enough. So I drag my sorry arse to the kitchen, determined to cook with the least fuss and the greatest speed possible so I could get some rest. I cook the Kingfish Soup with Angelica in the same way I cooked the Catfish Soup with Angelica and at the same time I get started on my dill rice. I'm going to cook a big batch so I can freeze the extra and have that as and when I feel under the weather or am just plain miserable. The dill rice is another creation that I put together after having Sabzi (I think that's how it's spelt) Polow at an Iranian friend's place. The dill she used was different though - Iranian dill, which I cannot get a hold of unless I make a trip to her house. So I just use normal dill but the taste is slightly compromised because of that. This dish is way, waaaaaay simplier than the Iranian dish but it is inspired by it and kind of a cross between Sabzi Polow and an Indian pillau. Use fresh dill ... none of the dried McCormick stuff. Shudder. The herbal fish soup was quite effective. I did feel a lot better after eating it but taste wise, it is still a 6.5/10. The increase of 0.5 over the Catfish Soup with Angelica was becasue the kingfish actually tasted better than the catfish with the herbs. I realise why so many kingfish recipes use the barbeque or grilling method. The flesh is quite firm and holds up well with intense cooking methods. I will definitely try to get my hands on some kingfish in future see what else I can do to it. Either the Kylie Kwong raw kingfish dish or a improvised ceviche or even smoked and lightly fried dish with shredded ginger, honey and chilli dressing. Smoked over lime leaves and tea ... hmmm ... I foresee a trip back to Carrefour. The dill rice was yummy as usual but I think I did not use enough dill this time as I was running low. Also, because I am not feeling 100%, I did not use as much butter. Still, when it is hot and fluffy, it's a real comfort food that can get rid of most cravings. *Waggle eyebrows* So it scores a 7/10. Now a hot cup of tea and bed so I can get back to the craziness of work with some level of energy tomorrow.